I don’t know if I’ve ever mentioned that Jason is an avid video game player, in particular, games like Starcraft and lately, League of Legends. A few years ago I made him a pair of Zerg slippers – he was a happy man. 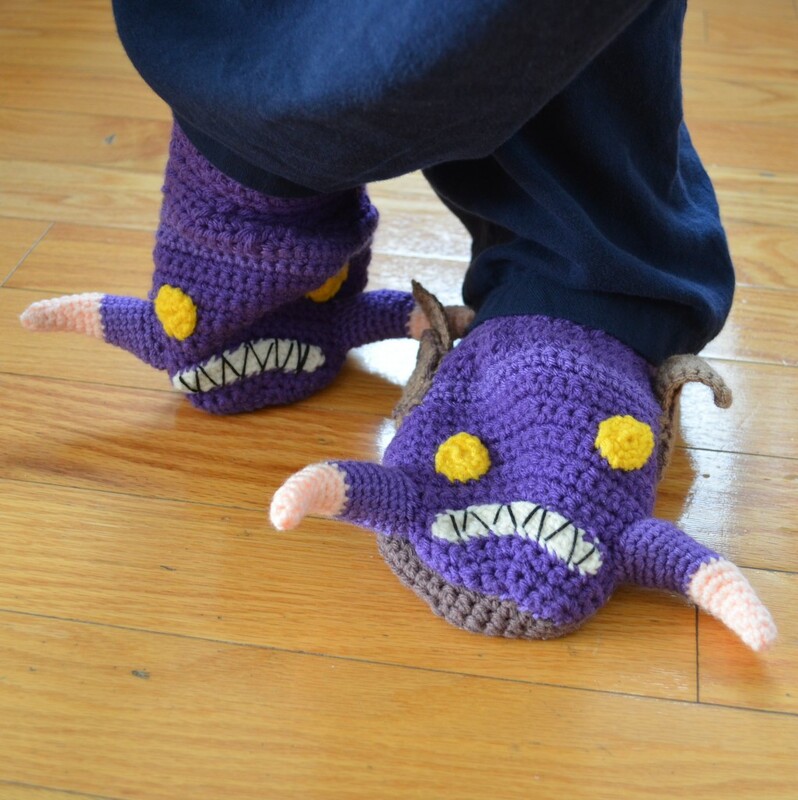 The slippers have long since been replaced by more sturdy and functional ones – it’s a little hard to walk when Zerg wings and limbs get stepped on. I must say, considering my skills were at beginner level those slippers look…not bad at all. I’m actually tempted to make an updated version but there I go, digressing! Okay, so maybe he does look cute especially with his little boots! It took me a few weeks to figure out the pattern and play around with shapes but I’m pleased with how this crochet Ziggs turned out. I’m especially happy with the bomb attachment. I was kind of dreading a few bits and pieces, like the goggles and the smile, but it was the bomb on his back that I left for last simply because I wasn’t sure how to do it. I wanted to be able to take the bomb on and off so I sewed snap fasteners to his back strap and bomb, and one on his hand. When I finally finished, Jay took one look at my creation and squealed. He’s still squealing now. 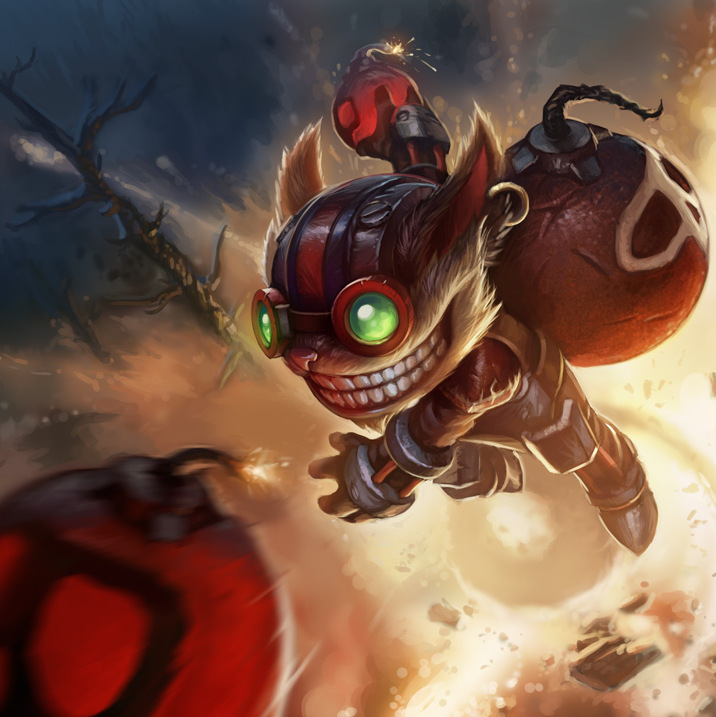 If you’re a fan of Ziggs (or know someone who might squeal with delight at receiving one) you can purchase the PDF in the shop or find the pattern below. -Worsted yarn such as: Bernat – Taupe, Medium Navy, Kelly Green, Pumpkin, Dark Grey, Maroon, Walnut, Berry, Baby Pink, Gold. -White felt for teeth and bomb skull. Fasten off, sew opening shut and weave ends. Rounds 2-9: ch 1, turn, sc across. Ch 1, evenly sc along the side edge, ch 1, sc along bottom. Rounds 2-3: ch 1, turn, sc across. Round 1: ch 17, sc in 2nd ch from hook and across to end, in last ch [sc, ch, sc], continue to sc on bottom side of ch across. You will have three long rectangles. Stack them on top of each other with biggest on the bottom and red strip on top. Use yarn tail on red strip to sew all three pieces together. With Pumpkin yarn, pick up stitch (does not count as sc). Ch 4, sc in 2nd ch from hook to end. Use safety pins to help guide you in attaching parts to the head. With yarn tail from bottom helmet piece, sew on to head. Make sure to attach goggles as you go along. Use a little fiberfill to stuff goggles but not too much. Ch 10, sc in 2nd ch from hook and across to end. Fasten off and leave tail for sewing to left ear. Use felt to cut out smile shape and then use thread to stitch teeth detail or just leave blank. Sew teeth to face. Use Baby Pink yarn to embroider nose. Round 1: ch 31, join with sl st. Do not turn, continue around. Sts in round 2 are worked around ch not through V’s, as pictured. Round 2: 4 sc, hdc, 3 dc, sc, 3 dc, hdc, 8 sc, hdc, 2 dc, tr, ch, tr, ch, 2 dc, hdc, 5 sc. Fasten off and leave tail for sewing. Brush the beard to give it a fuzzier look. Sew over teeth in a Cheshire cat-like smile. Fasten off, sew opening shut and leave tail for sewing head to torso. Round 7: ch 1, turn, sc across. Middle strap: Ch 30, sc in 2nd ch from hook and across. Fasten off and leave tail. Shoulder straps (make 2): Ch 20, sc in 2nd ch from hook and across. Fasten off and leave tail. Round 1: ch 7, sc in 2nd ch from hook and across, 3 sc in last ch, continue to sc along bottom ch. Round 2: ch 1, turn, sc 5, inc in next 3 sts, sc in remaining sts. Switch to Dark Grey yarn. Round 1: ch 4, sc in 2nd ch from hook to end. Round 2: ch 1, turn, sc across. Ch 11, sc in 2nd ch from hook and across to end. Fasten off and leave tail for sewing. Sew middle strap to chest armour. Slip onto torso and then attach shoulder straps to top corners of chest armour. Bring shoulder strap ends to back of torso and join to middle strap, making a stitch into torso to secure. 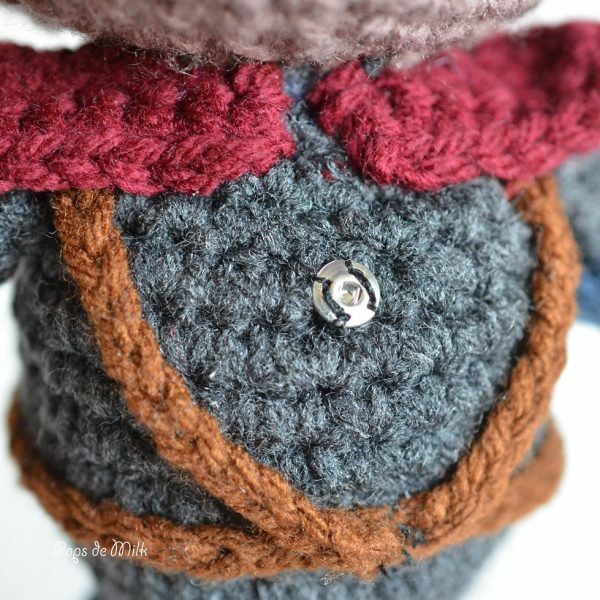 Use yarn tail from chest armour to sew onto torso. Once chest armour is attached, sew arms in place. Attach shoulder pads on top. With arms and shoulder pads attached, sew head onto body using yarn tail from torso. Sew hand shield over brown portion of arm. Wrap arm shield around arm and stitch in place. Use Berry yarn to embroider arm shield cables. Fasten off and leave tail for sewing. Cut a piece of gold yarn and tie a knot on one end. Pull through centre top of bomb piece and fray a bit to look like sparks. Fasten off and sew opening shut. With white felt, cut out skull shape and sew to bomb and embroider other detail. If your felt skull breaks apart (as mine did) you can use craft glue, like Mod Podge, to keep it in place. Attach snap fastener to bomb, hand (palm), and back of torso. 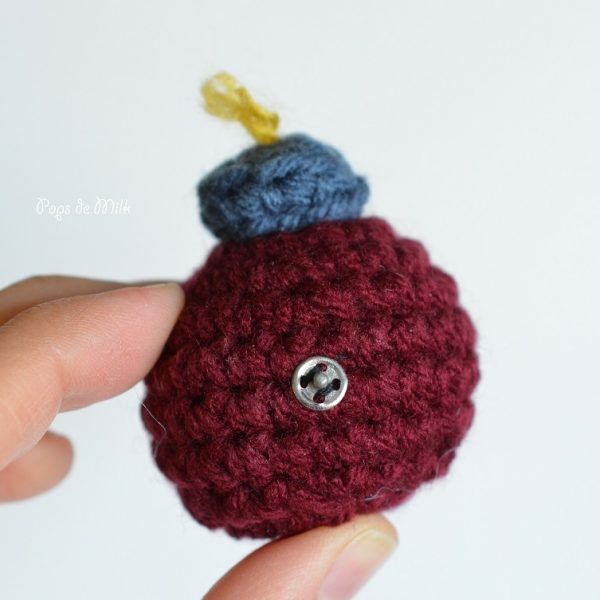 Alternatively you can just sew the bomb to back. Round 1: ch 6, sc in 2nd ch from hook and across to end. Round 2: ch 1, skip 1st st, sc, skip next st, sc in last st. Round 3: ch 1, skip 1st st, sc to end. Round 4: ch 1, skip 1st st, sc. Round 1: ch 5, sc in 2nd ch from hook and across to end. Round 2: ch 1, sc to end. Rounds 3-4: repeat round 2. Fasten off. Leave tail on 2 and weave ends on the other 2. Congrats!! 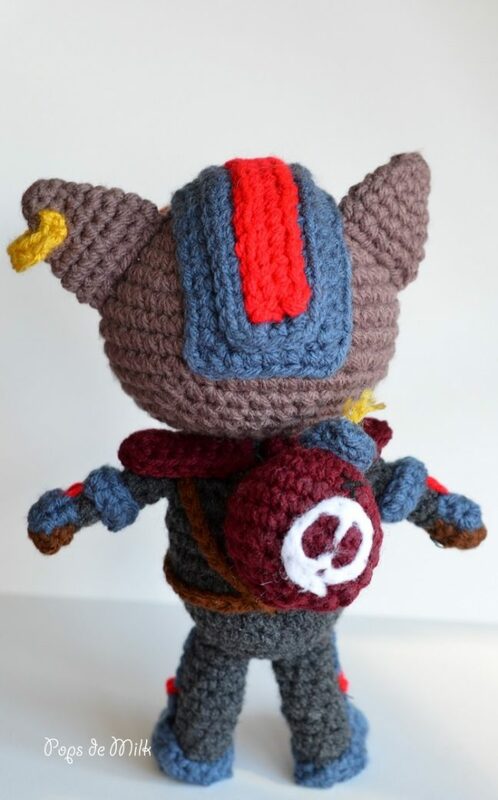 u r amazing, i a League of Legend player, and i think thats u make a big work there, my whife show me this great job, (she´s crochet fan) and i asked to do one form me xD. Keep the great job u do. PD: Please forgive me for my bad english. 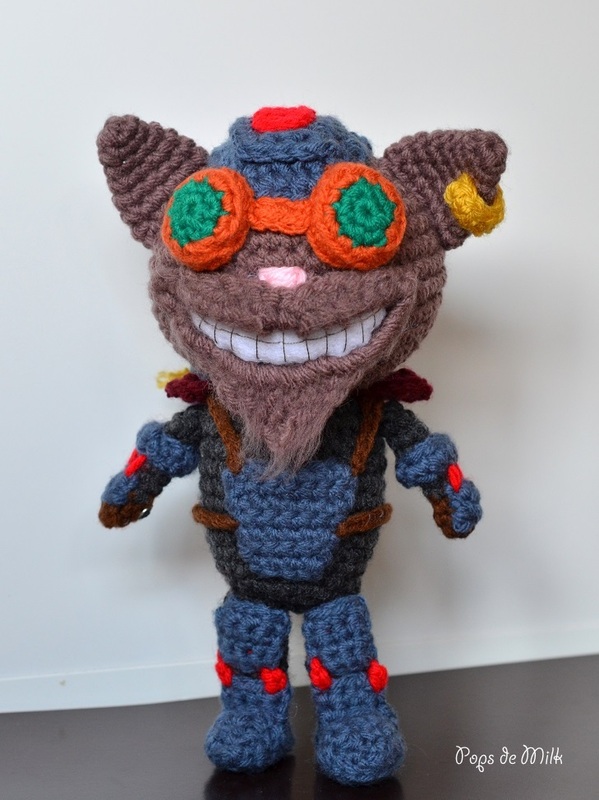 I ptinted toe free pattern for Ziggs. I do not have full directions how to assemble all of the parts. Can you help me?